Every Summer, my husband skips the flowers and brings home a bushel basket of basil from the farmers’ market. I turn that gift into a freezer filled with delicious, homemade Dairy-Free Pesto. You see, while basil is native to Asia and Africa, it’s Italy that has instilled this herb into our hearts... ever since pesto became one of the world’s most loved sauces. It's no surprise then that in Italy (and in my home! ), basil is a symbol of love. I also love basil for a few other reasons: its intense aromatic oil scares pests away to ensure a good harvest and it also happens to be an incredible guardian of your health, too! 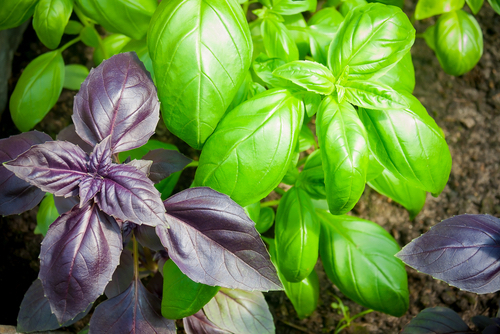 Adding basil to your diet can help to protect you from bacteria, yeast and mould. Basil has strong antibacterial properties.1 This powerful plant contains several essential oils that have been found to exhibit antimicrobial activity against a wide range of bacteria such as listeria, staphylococcus and salmonella.2 These strains of bacteria are widespread and becoming resistant to treatment with antibiotic drugs. 3. Basil is an antioxident. Basil can protect your DNA from radiation and oxidative damage because it contains compounds, called flavonoids. Two of these compounds, orientin and vicenin,4 5 have been studied extensively and results show that they protect the structure of cells, as well as chromosomes, from damage caused by radiation and oxidation. 4. Basil is excellent for your skin. Basil oil’s eugenol also has anticancer properties.7 It is well documented that eugenol has a protective effect against melanoma, skin tumours, osteosarcoma and leukemia. 6. Basil is excellent for your cardiovascular system. Hossain MA1, Kabir MJ, Salehuddin SM, Rahman SM, Das AK, Singha SK, Alam MK, Rahman A. “Antibacterial properties of essential oils and methanol extracts of sweet basil Ocimum basilicum occurring in Bangladesh”:Pharm Biol. 2010 May;48(5):504-11. doi: 10.3109/13880200903190977. Rattanachaikunsopon P1, Phumkhachorn P. “Antimicrobial activity of basil (Ocimum basilicum) oil against Salmonella enteritidis in vitro and in food.”: Biosci Biotechnol Biochem. 2010;74(6):1200-4. Epub 2010 Jun 7. Uma Devi P1, Ganasoundari A, Rao BS, Srinivasan KK.”In vivo radioprotection by ocimum flavonoids: survival of mice.”: Radiat Res. 1999 Jan;151(1):74-8. Vrinda B1, Uma Devi P.: “Radiation protection of human lymphocyte chromosomes in vitro by orientin and vicenin.”: Mutat Res. 2001 Nov 15;498(1-2):39-46. Viyoch J1, Pisutthanan N, Faikreua A, Nupangta K, Wangtorpol K, Ngokkuen J. “Evaluation of in vitro antimicrobial activity of Thai basil oils and their micro-emulsion formulas against Propionibacterium acnes.”: Int J Cosmet Sci. 2006 Apr;28(2):125-33. doi: 10.1111/j.1467-2494.2006.00308.x. Kathirvel P1, Ravi S.: “Chemical composition of the essential oil from basil (Ocimum basilicum Linn.) and its in vitro cytotoxicity against HeLa and HEp-2 human cancer cell lines and NIH 3T3 mouse embryonic fibroblasts.”: Nat Prod Res. 2012;26(12):1112-8. doi: 10.1080/14786419.2010.545357. Epub 2011 Sep 22. Jaganathan SK1, Supriyanto E.: “Antiproliferative and molecular mechanism of eugenol-induced apoptosis in cancer cells.” Molecules. 2012 May 25;17(6):6290-304. doi: 10.3390/molecules17066290. Umar A1, Imam G, Yimin W, Kerim P, Tohti I, Berké B, Moore N: “Antihypertensive effects of Ocimum basilicum L. (OBL) on blood pressure in renovascular hypertensive rats.”: Hypertens Res. 2010 Jul;33(7):727-30. doi: 10.1038/hr.2010.64. Epub 2010 May 7. Gums JG. : “Magnesium in cardiovascular and other disorders.”: Am J Health Syst Pharm. 2004 Aug 1;61(15):1569-76.